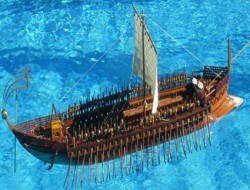 The boat of inepolis was constructed by Greek shipwrights in Inepolis of Pontus, which is situated in the shores of the black sea. SKU: WMS_01_006. Category: Model Ships. Tags: Black Sea, Boat from Inepolis, Model Ship, Pontus. The ship was built by using the method “first the shell”, although this method was abandoned since the 10 th century, It had an elegant hull, mainly black colored, while the bow and the stern were decorated with wood carved representations. This copy has a length of 70 cm with sails similar to the type of ship called “sakoleva” ,and the rudder, the stern and the bow are decorated with embossed representations.